The purpose of this procedure is to clearly explain what must be done in order to repair a MarineLINE® coated tank for service. The repair procedure should be used when the coating has been misapplied, damaged, or contains holidays (pinholes). NOTE: Be sure to mix MarineMEND Base Coat Part A with MarineMEND Base Coat Part B. 1 jar MarineMEND Base Coat (Part A). 1 bottle MarineMEND Base Coat hardener (Part B). NOTE: Be sure to mix MarineMEND Top Coat Part A with MarineMEND Top Coat Part B. 1 jar MarineMEND Top Coat (Part A). 1 bottle MarineMEND Top Coat hardener (Part B). Observe ALL safety requirements during this procedure, including wearing all appropriate personal protective equipment as detailed in Material Safety Data Sheets. This includes wearing solvent resistant gloves (shown above). See Safety Handling information. Pre-surface preparation includes a detergent wash and chemical cleaning of all surfaces to be repaired. All surfaces must then be dried. 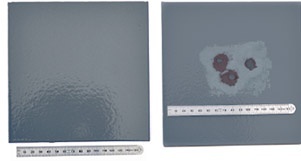 (Left photo) Steel plate coated with MarineLINE®, pending mechanical damage with a hammer. (Right photo) Damaged plate. 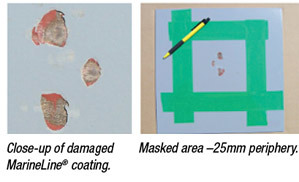 If the damaged areas are small and separate from each other, the small damaged areas may be hand sanded with a medium grit aluminum oxide sandpaper. Sand the topcoat (grey) of the MarineLINE® coating, and remove any rust spots. Remove topcoat (grey) of the MarineLINE® coating, and any rust spots down to a near white metal. Note: All areas sanded down to a near white metal, must have an area of 25 mm around its periphery. MarineLINE® coating topcoat (grey) removed to a feathered edge. Feather edge the sanded area so that no loose or sharp edges of the existing coating are observable. The area should be vacuumed thoroughly to remove all dust particles and washed with solvent (Acetone is preferred, Toluene and MEK are suitable alternatives) to remove all contaminants. When all preparation work is completed, pour the entire contents of MarineMEND Part B catalyst bottle into Part A container, and mix thoroughly for two to three minutes. Note: The pot life of the MarineMEND Base Coat kit is 30 minutes maximum @ 20°C. Make sure all surface preparation is completely finished before mixing the kit. 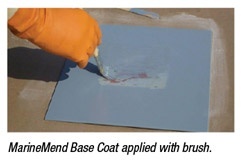 Use a small brush or paint roller to apply the mixed components of MarineMEND Base Coat to the properly prepared surface, coating the entire prep area. Apply a wet film thickness of 160-200 microns. Allow Base Coat to B-stage with good ventilation until coating has tacked up but released all solvent. (Coating leaves a fingerprint but does NOT come up on finger – this may take up to 24 hours depending on temperature and air flow). When the Base Coat has reached proper B-stage, pour the entire contents of MarineMEND Top Coat Catalyst Part B into the Part A container, mix thoroughly for two to three minutes. Use a small brush or paint roller to apply the mixed components of MarineMEND Top Coat to the properly prepared surface, coating entire repair area. Apply a wet film thickness of 160 to 180 microns. 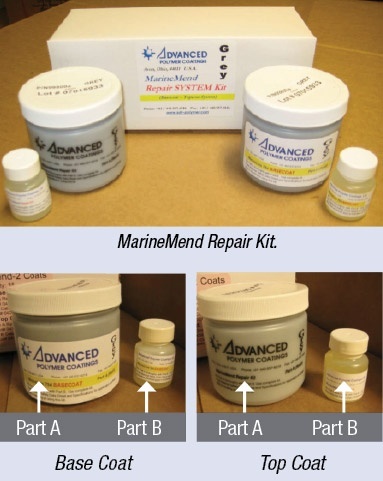 Note: The pot life of the MarineMEND Repair Kit is 30 minutes maximum @ 20°-25°C. Make sure all surface preparation is completely finished before mixing the kit. Post-cure MarineMEND System with heating/steam coils at a minimum substrate temperature of 60°C for 24 hours. Post-cure MarineMEND System with ambient/environmental conditions to a minimum of 30°C and hold for 3 days, followed by a hot cargo or hot water at following temperature and time (days). When stored at temperatures between 20-25°C, the repair kit shelf life is 12 months. When applied at temperatures between 20-27°C, the pot life for either coat would be around 30 minutes. During surface preparation, a profile needs to be created that allows the bonding of the coating to the surface. After the application of either coat, drying time is required prior to applying a second coat or heat curing. Heat curing is required for the optimum performance of the repair coating.